The year was 1989. SEGA’s brand new 16-bit console, the Mega Drive had launched under the name Genesis in the west. It was the arcade experience at home, or so SEGA was so proudly stating as part of their advertising campaign around the time of the systems launch. Popular arcade titles such as Altered Beast, Afterburner and Space Harrier had all launched alongside the system in Japan ten months earlier, during the October of 1988. The system did a decent job at emulating the arcade experience, but the quality of ports did vary depending on the development team. Meanwhile, Westone were still developing for 8-bit SEGA hardware. 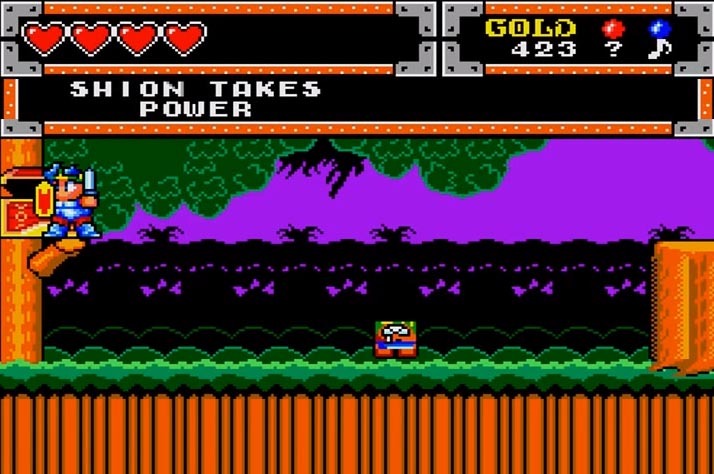 Their advantage of releasing The Dragon’s Trap late in the Master System’s life was that it had a much larger install base than the big blue’s new swanky 16-bit system. The Mega Drive was expensive too, just like any new hardware is upon initial release. Keeping these advantages in mind, Westone crossed their fingers and launched The Dragon’s Trap during 1989, hoping that SEGA’s next generation mammoth wasn’t to over-shadow their big release. Thankfully, it did not. The Dragon’s Trap received strong positive reviews across the board. In the December issue of 1989, Electronic Gaming Monthly awarded the game with the prestigious title of “Game of the Year” and other publications such as Game Pro and The Games Machine went on to provide in-depth coverage and high review scores. It wasn’t long before word spread, leaving critics and gamers everywhere immersed in Westone’s open world marvel. 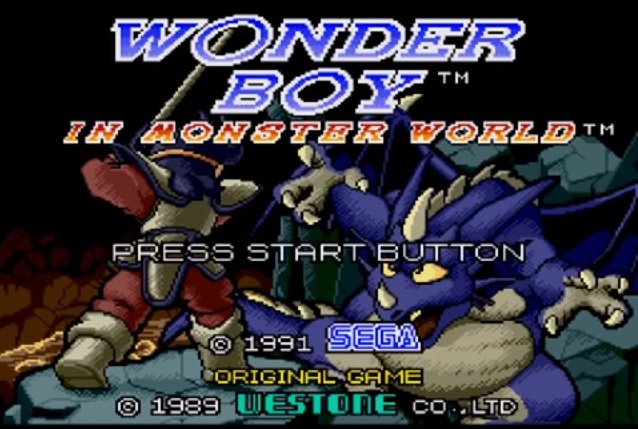 The small Japanese studio was enthralled at the response they were getting and the path forward became clear to them; expand upon the open world adventure style of game established in Monster Land and put the pressured side-scrolling action of Wonder Boy to rest. Soon after the release of The Dragon’s Trap, Ryuchi Nishizawa and the team got straight to work on the next game in the series. The company was to build on the strengths of their previous title, while also adding in some brand new features and mechanics to help make their new product feel unique. 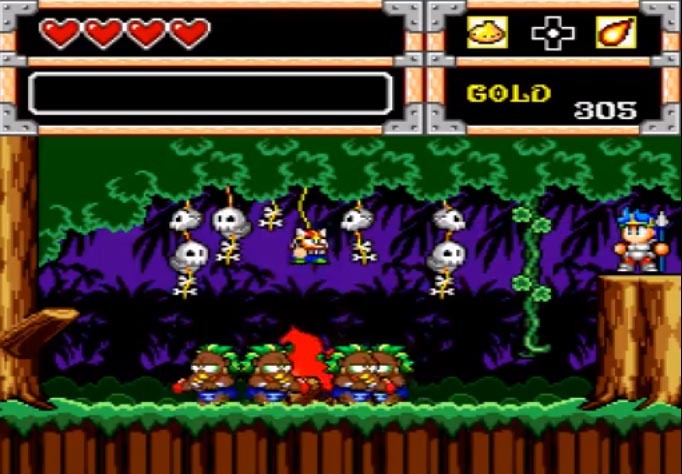 It took a total of two full years until their next game was released, hitting stores in Japan during the October of 1991. It’s clear a lot of development time and effort was put into their next big title, but let us not forget that Westone also released a couple of other games during this time. These include Aurail, a scrolling shoot-em-up where players take control of a tank and Riot City, a beat-em-up similar to Final Fight or Streets of Rage. Westone were able to take complete advantage of the next generation hardware, allowing them more colours and larger sprites. Each character was able to sport more frames of animation too, allowing for more exciting and engaging visuals. This meant more weapons, more attacks and more enemies- essentially everything became bigger and, in theory, even better than before! This was excellent news for Westone, as their next game had a lot to live up to. 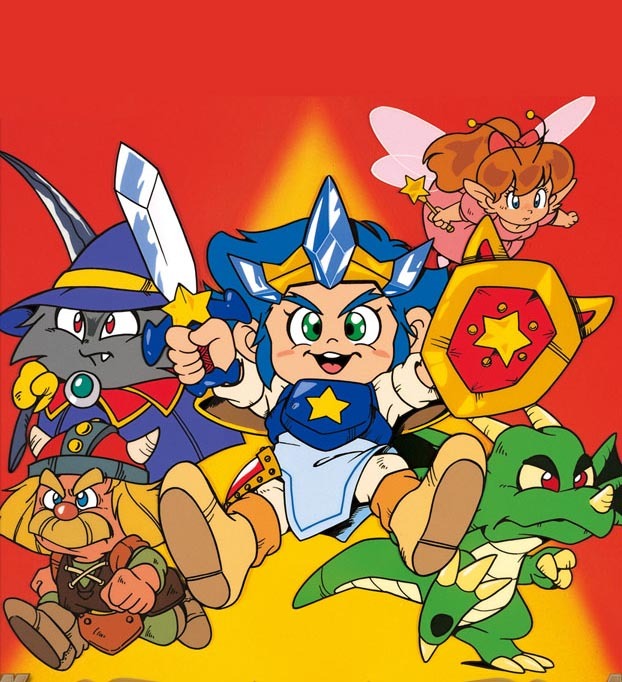 By 1991, The Dragon’s Trap had sold well in both Japan and the west. Add to that the fact it was being regarded by many as the finest 8-bit title on any platform and it was clear the studio were in for a tough challenge. They just had to meet the high expectations of many hungry gamers around the world and it was not going to be easy. 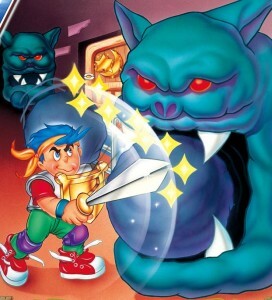 The confusingly named Wonder Boy V: Monster World III launched in Japan on October 25th, 1991 and it features a brand new monster-ridden world for you to explore. 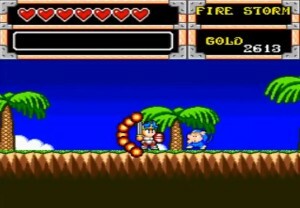 The title was later renamed to the much more appropriate Wonder Boy in Monster World when released in the US and Europe, ditching the numbers entirely. 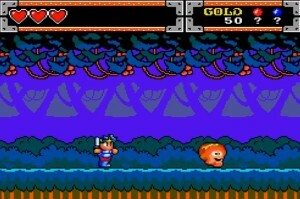 Unlike Wonder Boy in Monster Land, Monster World was built from the ground up for the home console. 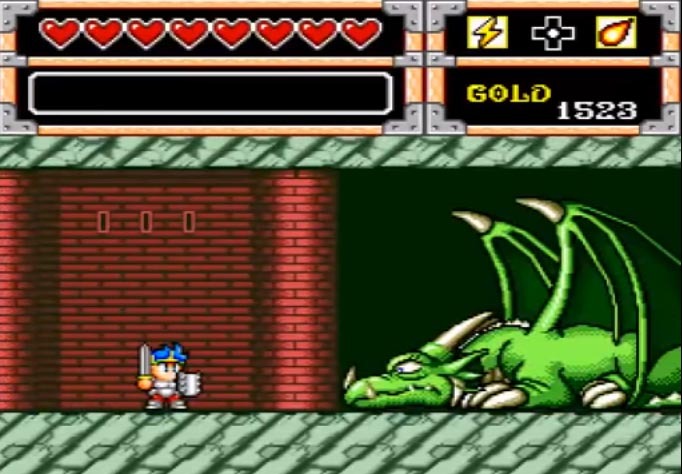 Small man versus giant fire breathing dragon. We know who we have our money on. Sorry, Shion! Game fundamentals remain the same- the screen scrolls left and right as the player navigates through towns and dungeons, thwarting foes and collecting gold. Why change what’s not broken, after all? As with The Dragon’s Trap, the depleting timer is thankfully no-where to be seen and a status bar can be viewed atop the screen. This displays the players life energy, currency and equipped items. 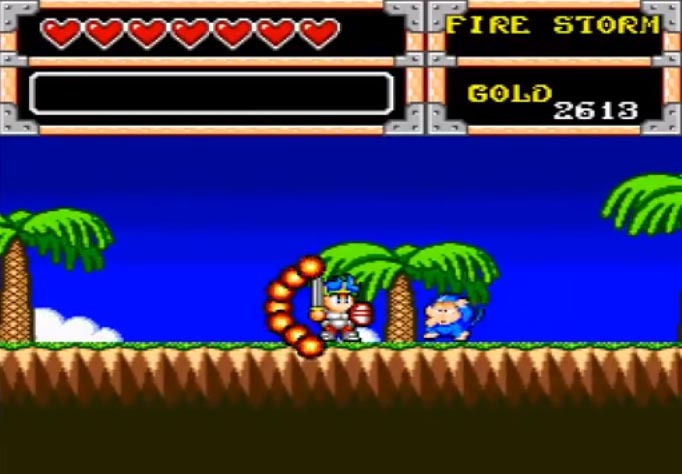 It also pops up with the enemies life bar upon successfully smacking a monster, which is extra handy. Some would argue the screen is too cluttered and we would agree that the HUD does take up a good chunk of the viewing area. Thankfully, it never gets in the way of the action as the in-game game graphics are designed with it in mind. If anything, it helps players keep check on as many statuses as possible at a quick glance at the top of the screen, which is extremely useful for an adventure RPG such as this. Just like in Super Mario, the most basic enemies in Monster World are mushrooms. Kill it, Shion! I detest mushrooms. Ruins a perfectly good spaghetti bolognese. As mentioned earlier, the story of Monster World follows a young boy named Shion. Just as those before him, Shion gets bored and decides to dress in his finest suit of armour, leave his house and save the kingdom from a horde of invading monsters. During the initial stages of his travels, Shion comes across a small fairy village. After saving the village from all sorts of horrible beasties and defeating the mushroom king who is taking refuge in a nearby forest, Shion meets up with the beautiful Fairy Queen Eleanora. Eleanora points Shion in the direction of the nearest city and grants him a companion, a small fairy named Priscilla. This just had to be a descendent of Princess Purapril from Monster Lair. The princess I know was never this bossy. In fact, she never said a word! Priscilla is the first of four companions Shion is to travel with on his quest, each having a special ability of their own. Others include a dwarf, a dragon and tiny grim reaper. Shion is going to need all the help he can get, as his quest takes him through many dangerous environments. Take for example a scorching desert with sands so hot it can only be traversed after first obtaining a special pair of oasis boots. Shion is to meet up with many characters too, all of which exploit him for his courage and use his powers for their own selfish desires. Perhaps that was a little too harsh, as they all end up helping Shion in return. One of these characters is Princess Shiela Purapril, a sort of love interest for our hero. You may recognise the name, as she is supposedly a descendent from the second player character found in Monster Lair, Princess Purapril. She calls upon your aid a little while into the game and supports Shion in his quite bizarre final hours, taking down an evil being known as the Bio Meka who is found flying around space in a humongous spacecraft. The story is a much more integral part of the game this time around. 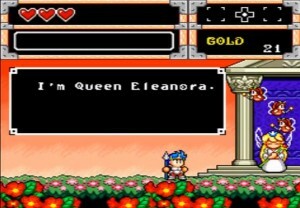 There are plenty of non-playable characters to interact with and a whole heap of new dialogue. While it is nothing ground breaking, it’s certainly a decent effort and the penultimate moments of the game are very surprising. Westone certainly threw gamers a curve ball with this one as the final dungeon is definitely not something you would expect to see in a fantasy themed game such as this! Mmm, dwarf child. Tasty! Who wants first dibs? We’ll take that blue haired kid and his pointy spear for dessert. Wait a second, did you say pointy spear…? Uh oh. Run away, lads! 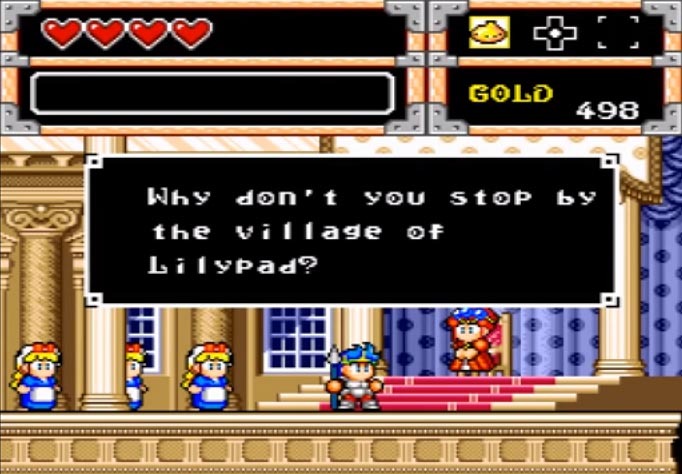 There are plenty of nods to previous games in the series too, including a sphinx that quizzes you on Monster World lore and the return of the famous nightmare castle music. At this point, these have become a staple of the Monster World franchise and it’d be a crime to see a title lacking either that famous dungeon theme or a tricky sphinx of some sort! Monster World’s visuals are pretty, with a colourful look that feels like a true next gen version of the Monster Land style. Some would argue that it is a little too simplistic, as it has flat backgrounds with very little parallax scrolling and foreground images that contain little amount of detail. Be them simplistic, it cannot be denied that the visuals are lovely. Some areas even feature parallax scrolling, such as this one! We think the look works well however and we especially appreciate some of the shading on the backgrounds and the environment. Hand-drawn style shading or colouring effects can often be spotted on trees or other objects scattered about the place. It’s a good look and it helps set this games visuals apart from the rest. 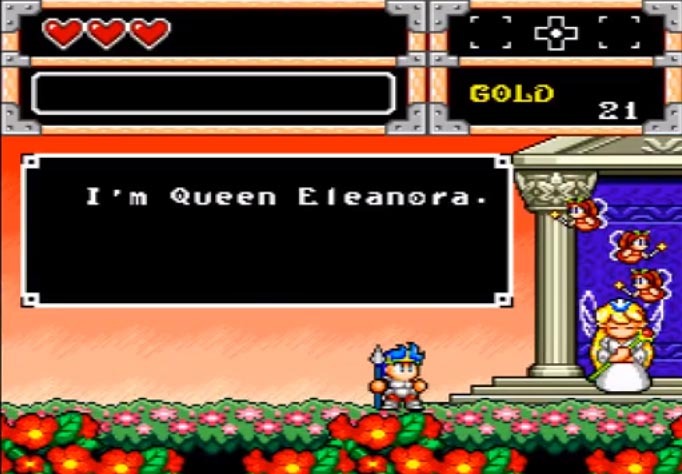 One of the most notable instances of being able to spot this effect is on the backdrop of the scene with Fairy Queen Eleanora and it’s something we wish we had seen more of. As for the gameplay, not a whole lot has changed here. Shion collects a variety of different weaponry on his quest, each having different attributes. There are the traditional swords and shields, but now also spears which are handy for long range attacks. 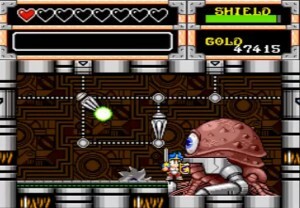 It’s also possible to spin the spear like a windmill by holding the up arrow on the directional pad and pressing the attack button. This neat little trick essentially creates a short but sweet impenetrable barrier in front of Shion and if nothing else, it looks super cool once pulled off effectively. Monkey, meet fire! There are six magic spells to find and they are all an absolute joy to use. There are now magic spells too. 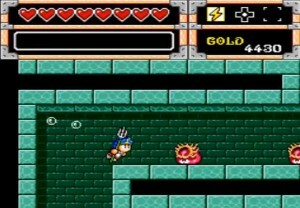 Players can make use of six in total, all of which are found either from treasure chests or by defeating certain enemies in the game. Firstly, there is Fire Storm. This allows Shion to launch a flurry of fire balls and home in on nearby foes. It’s the first spell players come across and it has the most uses, so understandably it is considerably weaker than the rest. Next we have Thunder. Perhaps my personal favourite, this attacks all enemies on the screen with deadly lightning bolts and wipes out basic foes in a single blow. Quake is self-explanatory, shaking the ground and damaging all enemies that are neither flying nor swimming. Shield grants Shion invulnerability for a limited period of time. If hit while Shield is cast, the amount of time the spell is active will decrease quicker, so it is still worth proceeding with caution. Ol’ Indie has nothing on Shion. Snakes are child’s play compared to giant living mushrooms. Power is next, an extremely useful buffing spell that dramatically increases Shion’s offensive power for a limited period of time. Plan your attacks carefully, as the timer depletes upon every successful hit. Last but not least is Return. This ability warps Shion to the last location of which the game was saved, most likely being a nearby inn. These spells can be equipped through the item menu and have limited uses. They can only be replenished by sleeping at an inn, so be sure to make use of them wisely. Each is fun to use and they are a great addition to the game. 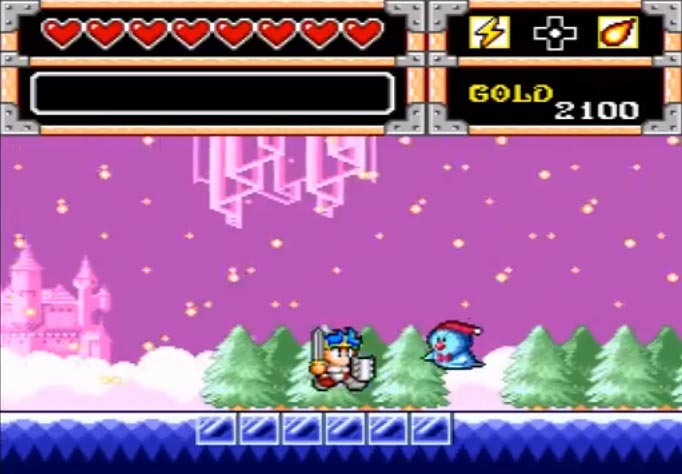 It is also possible for Shion to swim underwater in Monster World by using a special item, Poseidons Trident. Tom-Tom, eat your heart out! 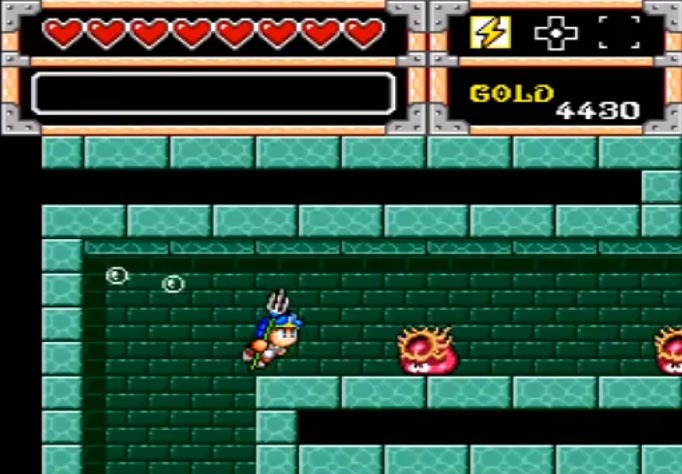 With this item equipped in the weapon slot, Shion is able to cruise underwater alongside the fishes and through a particularly tricky submerged maze towards the final parts of the game. As it’s equipped through the weapon slot, it can also be used to poke bad guys in the face too! What more could you need? Don’t mind me. I’m just a harmless fish minding my own business. I’m definitely nothing going to poke you with this giant pointy stick thing, honest. Faster movement, would be one thing that springs to mind. One of the major downsides to Monster World is that speed of which Shion moves. For a good few hours at the start of the game, it will feel like Shion is going for a leisurely stroll in the park rather than facing his greatest foes and saving the world. It’s enough to put new players off, but we implore you to stick with it. After exploring and earning enough gold, players can purchase new boots that upgrade different types of movement. 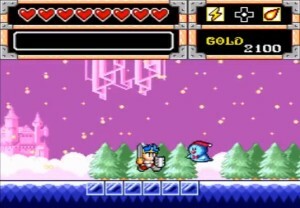 The Ladder Boots allow Shion to scale ladders much quicker, while the Marine Boots allow for faster movement underwater. By the time you reach the final sections of the game and earn the Legendary Boots, you will be whizzing around like Sonic on free chilli dog day. While faster movement speed is nice and helps save a lot of game time, it can make traversing icy surfaces extra tricky! A big improvement in Monster World is the added ability to save the game. By visiting an inn located in each and every town you come across, players can pay a small fee to rest the night, recovering hit points and saving their game. The gameworld is much bigger this time around so a save system was essential. Be wary though, as the further you progress the more expensive it becomes to rest at an inn. 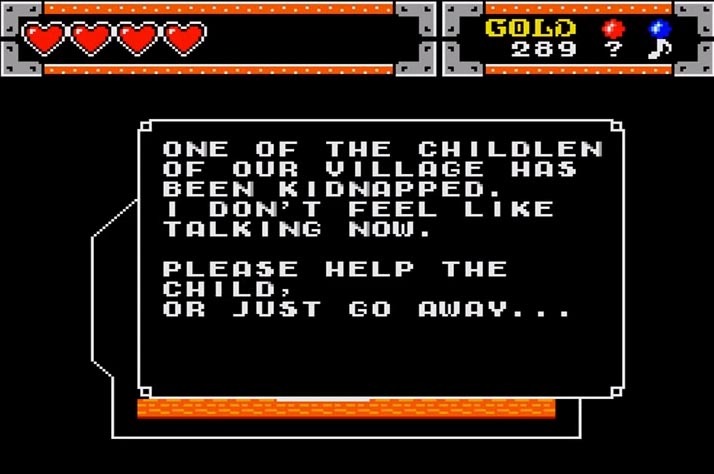 Be sure to collect as much gold as possible, unless you fancy back-tracking all the way to towns found earlier in the game and risking an untimely death! 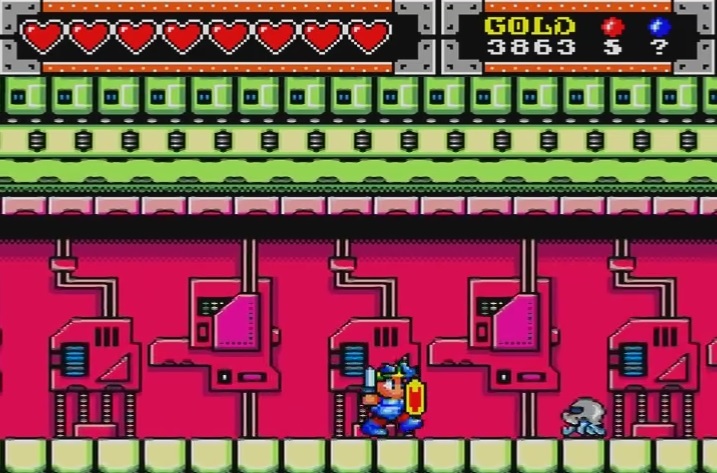 Just as with Monster Land, there are many boss battles found hidden throughout the kingdom. 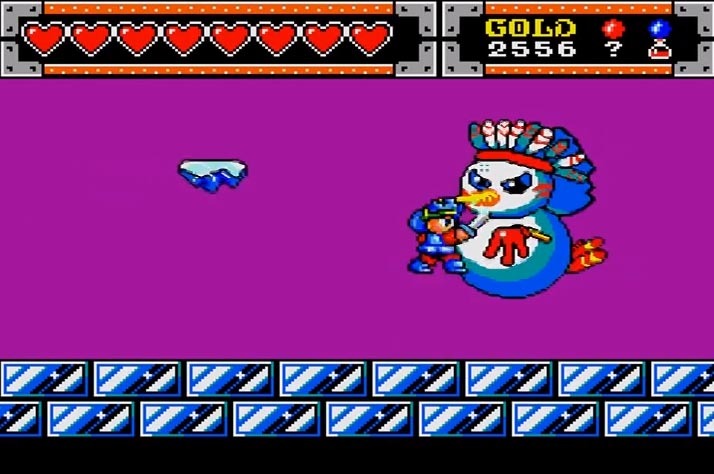 These are varied, ranging from the giant mushroom we mentioned earlier to an aggressive flying snowman. The boss sprites are huge, often filling up the screen and only further adding to that sense of accomplishment players get after successfully taking one down. They’re well designed too, each with different patters that Shion will need to learn if he wishes to become victorious. 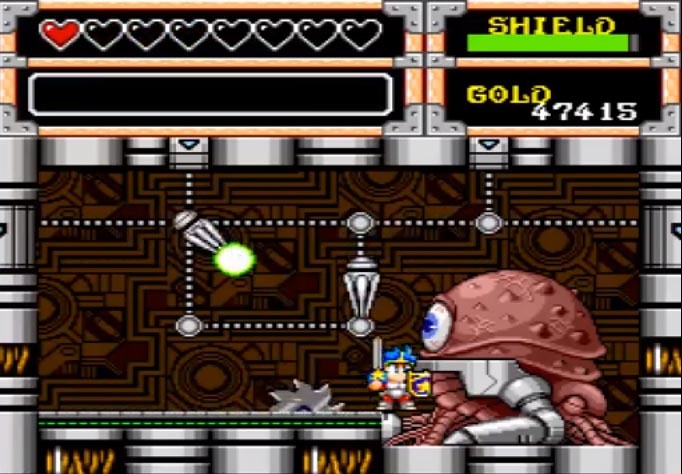 The final boss fight in the American version of the game is essentially the Mother Brain fight from Metroid turned up to eleven. An interesting note about the final boss, the Bio-Meka is that it is actually different in the American version of the game. 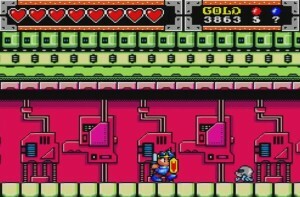 The original Japanese cartridge featured a much more straight-forward fight, one that was flagged up by Japanese fans as being far too easy. So, what did Westone do for the western release? They made it harder. Ten times harder. To the point of it being completely ridiculous. There is now a conveyor belt underneath Shion’s feet that alternates from moving left to right, with a saw blade running along it independently. It sure is a nuisance of a boss fight and it can become frustrating very quickly. With that said though, if you spend plenty of time exploring the game and collect enough magic Thunder spells, it can help take out the laser cannons and make the fight that little bit easier. We wouldn’t suggest attempting it without Thunder, that’s for sure. Why the long face? Oh yeah. Your kingdom is under attack and all your friends are dead. Sorry! 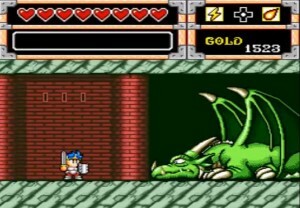 Many gamers were initially disappointed that the transformation mechanic from The Dragon’s Trap is no-where to be seen. 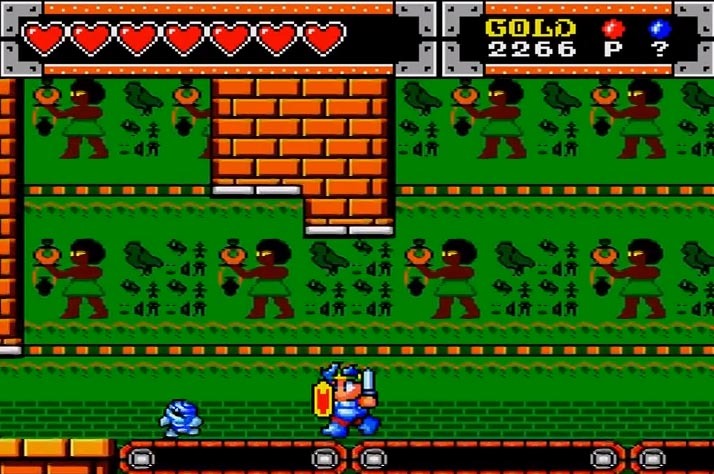 It was an aspect of the 1989 Master System title many had come to love and a mechanic they expected to see developed upon in further titles. As much as we loved changing into different beasties and using their abilities to discover new areas, we were never too saddened by its departure. The transformation mechanic helps keep The Dragon’s Trap feeling unique and it was likely the development staff wished to try something else. We strongly suggest taking a trip into Shion’s world and experiencing for yourselves the solid side-scrolling adventure gameplay of Monster World. What are you waiting for? Brave adventurers, our journey is not over just yet. Shion’s journey continued onto the 8-bit SEGA Master System console in a port that was exclusive to the European video game market. How did it fare when compared the the original 16-bit Mega Drive version? Let’s find out! 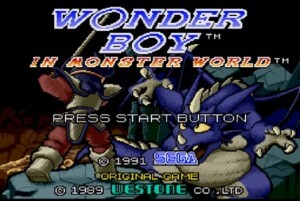 Wonder Boy in Monster World came to European SEGA Master systems in 1993, two years after the original. 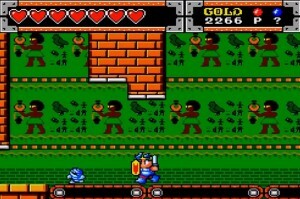 While the 8-bit version sported all new redrawn graphics, it still featured largely the same content as its 16-bit SEGA Mega Drive counterpart. Run, forest, run! One good thing about the Master System port is that the HUD is much better condensed. So, why was this title only released in Europe? It’s likely due to the Master Systems continued success across the European market. While the Nintendo Entertainment System dominated the US and Japan during the late eighties / early nineties, the Master System was getting a fair amount of love overseas. Many 8-bit conversions of popular 16-bit SEGA titles were ported over for these territories, often handled by small teams within SEGA. These ports sometimes made their way to the US but instead for the portable SEGA Game Gear. We got power! Seize it, Shion! Use it to show those nasty monsters who’s the boss! It was no doubt a tough challenge to essentially downgrade a next generation game for older hardware and as such, ports varied greatly in quality. Titles such as Disney’s Castle of Illusion made a successful jump to 8-bit hardware with the development team re-designing certain mechanics and areas around the more primitive platform. The task could prove too problematic for some developers though, with the finished product often feeling rushed, ill-thought out or in some cases, unfinished. It is unfortunate then that this is indeed the case with Monster World. Whoever designed the interior of this pyramid sure loved green. The visuals are actually very pretty, but sadly that’s about all the game has going for it. At a glance, the Master System version looks fantastic. 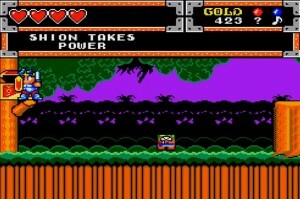 The game offers some mighty impressive visuals with colourful, vibrant graphics that are sure to make Alex Kidd go green with envy. 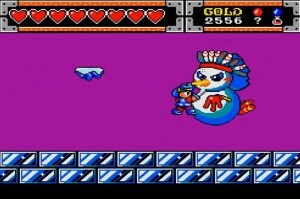 Characters and enemies are represented by large, detailed sprites that do not look too dissimilar to how they appear in the Mega Drive version. Shion has plenty of animation and everything runs with very little struggle. Frame rate drops are kept to a minimum which we have to give the development team credit for when taking the specifications of the older hardware into consideration. Sadly, this is where the positives end. The game is riddled with issues, the biggest being control and hit detection. Combat is the staple of any adventure RPG and in the 8-bit version of Monster World, it falls flat on its face. Hit detection is way off, with Shion’s attacks often missing and enemies landing hits on you from tiles worth of distance away. It is almost not worth using the standard sword attack as the reach is far too short. The only other solution is to attack whilst crouching, which causes Shion to lay down on the ground and thrust his sword forwards, gaining a little extra reach. This precious extra reach is vital when attacking the majority of enemies in the game and crouching all the while makes the combat become tiresome much quicker than we had hoped. Fine, be that way. See if I care. The bloody cheek of some people, I don’t know who they think they are. The structure of the game is a little different, which is to be expected. Some levels are modified so that they are shorter in length. An example of this would be the sewer area below Princess Purapril’s castle, which has had a few redundant sections removed. 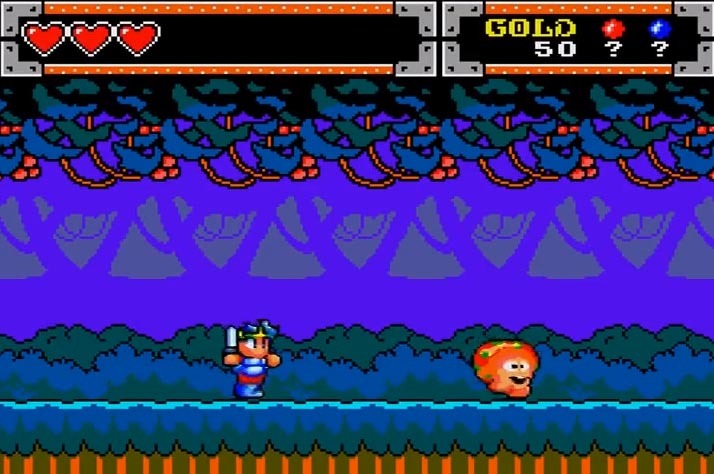 Some areas are cut all together, resulting in a considerably shorter version of the game. We can’t falter the developers too much for this though, as they had far less system memory to work with. The vast majority of the environments, boss fights and story content is the same which is a rather pleasant surprise. What is not pleasant however, is the music. The audio quality has taken a huge hit when downgraded for the older hardware and there are far less background tracks than in the 16-bit version. 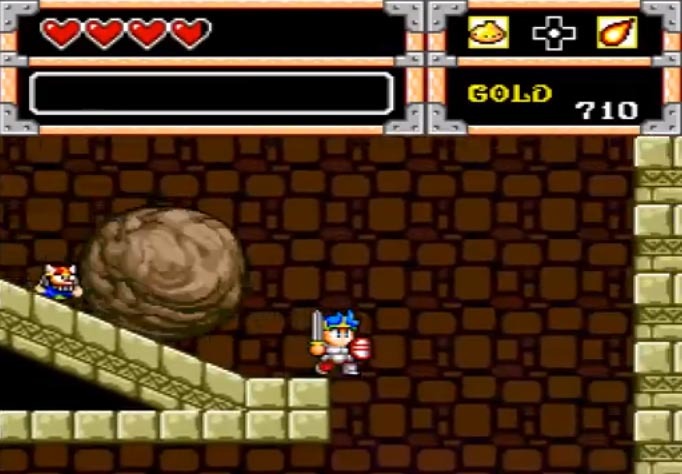 Neither Nightmare Castle nor The Last Dungeon are anywhere to be found, instead replaced with the bleeps and bloops of the generic dungeon music. It’s a shame and sadly, it isn’t even the worst part. The music is repetitive and quite dreadful, which is a shame considering the Mega Drive version has a short but sweet soundtrack. Each music track resets every time Shion just about does anything. Progress to a different area, the music resets. Enter a house, the music resets. Exit a house, the music resets. Add to that the fact there are only a handful of songs included throughout and it becomes enough to drive anybody insane. We recommend playing on mute, or even better, loading the Mega Drive soundtrack onto a portable music player and listening to it instead. Another aspect of the game we’re not a huge fan of is the password system. The inclusion of one is by no means a bad idea. 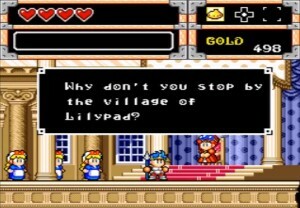 After all, it is highly unlikely the Master System would have enough memory to manage a sophisticated save game system. Passwords are a great alternative but after playing this game, you will never want to see one ever again. The final dungeon lacks the catchy, heart pounding background music of the 16-bit version. It’s just not the same! Who knows why the programmer decided to make each password forty characters in length. Perhaps he was possessed by the devil himself? He would have to be because including codes this long is nothing less than absurd. It makes turning the game off a chore. Maybe this was their goal- a secret ploy to keep people playing. Regardless, it’s a huge pain in the behind and it is not something we’re a fan off. Boo to you, mister programmer. On this occasion we think that it’s actually a good thing this title never left Europe. We just cannot recommend the 8-bit conversion of Monster World. The game has far too many negatives that do nothing but provide a frustrating and therefore un-enjoyable experience for the player. It’s disappointing, especially after the success of The Dragon’s Trap four years prior. If you are a huge fan of the Mega Drive version it may be worth checking this out simply for comparisons sake, but otherwise steer clear. 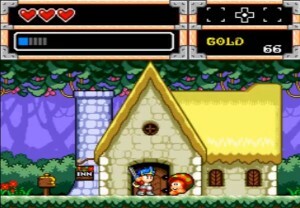 Wonder Boy in Monster World on the Mega Drive is all of the best bits from the previous titles and then some. There are plenty of worlds to explore, treasures to discover and monsters to defeat. The RPG elements have been improved, with Shion constantly upgrading his equipment and abilities right up until the final dungeon. Exploration is key, as there are many optional items that can be essential in aiding Shion’s quest hidden around the place. This is most definitely your definitive Monster World experience and it remains today as one of our favourite adventure games of all time. The Master System version on the other hand falls short in too many places. The combat is frustrating, with the player and enemy hit detection being totally out of whack. The soundtrack is underwhelming when compared to its 16-bit counterpart and what is included in the game makes us strongly consider chopping off our ears. It pains us to say it, but the 8-bit version is just not worth your time. If we had seen an original title or perhaps even a sequel to The Dragon’s Trap released in 1993 then this may have been a very different story. 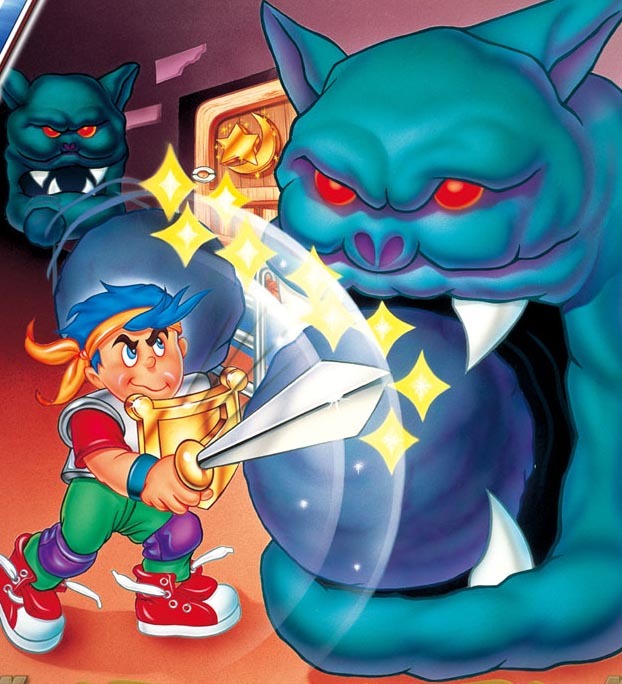 If you plan on embarking on your own adventure through Monster World, then we strongly recommend picking up the Mega Drive version over the problematic Master System port. Wonder… Girl?! It is said that fans were initially outraged that the next Monster World protagonist was to be female. Boo hoo. We love Asha! Monster World IV is coming. The final title in the Monster World franchise does not disappoint and it is about to evolve the series in some very unsuspecting ways! After hearing a cry for help from some mysterious wind spirits, a young girl named Asha decides to set out on a life changing adventure. Accompanied by her adorable flying pet pepelogoo, Asha wishes to aid the wind spirits, heeding their call and embarking on the journey of a lifetime. This is one pleasant and polished experience that is sure to capture your heart. 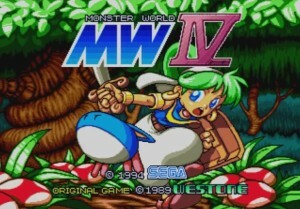 This is one Monster World title you will not want to skip, so be sure to check the fourth and final part in our retrospective as it is uploaded in the coming weeks. Perhaps there will be a small surprise waiting, too…?